When Barack Obama became president of the United States, many people hoped and pictured the fact as a sign of a post-racial era at last, but several years later many people disagree as well after difficult events generated the #BlackLivesMatter movement in the past recent years. 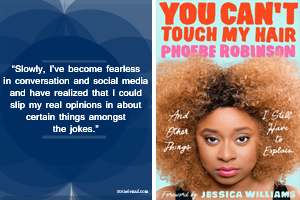 A voice on the rise is comedian Phoebe Robinson, and as she stated in her book You Can’t Touch My Hair “Just three years ago, no one knew who the hell I was”. Her confidence has paid off and “Slowly, I’ve become fearless in conversation and social media and have realized that I could slip my real opinions in about certain things amongst the jokes.” Her real opinions in this book include racism and sexism through hair history, her story, jokes, and pop-culture references. 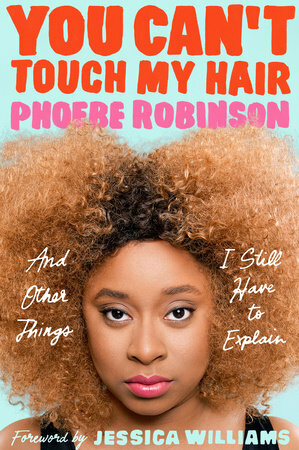 In You Can’t Touch My Hair, Phoebe Robinson explains “…about being a black lady in this day and age.” Topics as microaggressions, uppity and its racial connotation, jobs, stuff like a thighbrow, and being a fan of U2. For sure these days are better times than Martin Luther King or Rosa Parks had to go through, but reading Phoebe Robinson’s book denotes it’s plenty still to heal to get into a post-racial era in the United States. Moreover, add to the situation that Robinson is a woman and a comedian. There are affiliate links. I receive an affiliate commission if you decide to purchase from Amazon, Apple Books, Powell’s Books or IndieBound, at no additional cost to you. Thank you in advance.